3 of us fished Sudbrook 8pm till midnight, nice night for it water was very calm and no real problems holding bottom considering it was a big tide. Fished on the far right of divers rock, loads of good solid bites from the start and it wasnt long before Gaz407 landed a codling of around a pound, closley followed by BTF. Elpez2k was getting frustrated, loads of bites but no fish at the end of the line, he finaly did hook into something around hightide that got him excited, only for it to come off seconds later. He did finaly manage to land himself a few fish about an hour down. Much better size than the last few times we've been up there but no "takers". Good nights fishing anyway. Elpez2k and Silverback fished divers rock saturday morning 5.30 - 8.30. They got there to find the water like a mill pond, no one else there so they had the pick of the ledges. Silverback struck 1st within 10 mins of his 1st cast hitting the water a small codling of around 5oz. 5 minutes after him Elpez2k brought in his 1st in which was around the same size. As they got to high tide they were both pulling in a fish a cast, all on lug/squid cocktails. Carried on fishing well untill around an hour into the ebb when it went quiet. 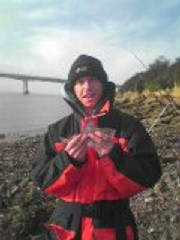 7 of us fished Divers rock from 18.30 - 22.00, Comfortable conditions for fishing, mild and just a slight westerly breeze. We spread out along the ledges most of us were fishing two rods using lugworm/squid for bait. Fished very slowly on the spot that had done so well only 2 days earlier. At the other end of the ledges Shane B was taking fish at close range on light tackle most casts, next to him Elpez2k pulled in his second around half hour after high tide. BTF and Gaz407 were placed in the centre of the ledges now started to catch too. The codfather and Elpez2k fished Sudbrook beach just to the left of divers rock. 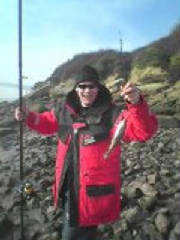 1st cast hit the sea about 9.00am both were using blowlug,squid and peeler crab for bait. two rods each one with larger baits and a smaller 3 hook flapper rig on the other. Very quiet up to high tide with only a few bites between them, about 10 mins after high tide Elpez2k pulled in his 1st codling of the day. The Codfather could only watch as Elpez2k quickly pulled in another two all so far were on the scratching rod, but a few bites were now showing on the larger bait but still no connection with a fish. Elpez2k, The Codfather and Shane B fished just to the right of the lifeboat station on Penarth Front From 20.00 till 00.00. Armed with Lug and Squid for bait. High easterly wind and some rough seas made for an uncomfortable evening for the trio. Bite detection was almost impossible in the high winds and large amounts of sea weed were being dragged in. No sign of a fish untill around an hour in, when Shane B landed his 1st Codling of the evening. Tackle losses for both the Codfather and Shane B slowed down the fishing, meanwhile Elpez2k was having no better luck trying various distances and bait combos desperate to land a fish and continue his good run. Into the last 2 hours of flood the boys hoped that the fishing would improve, no such luck only shane B managing to catch another 2 Codling around an hour before high tide. 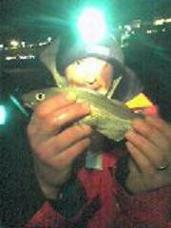 At midnight it was all over for Elpez2k whoose run had seen fish on every session since early November. Also 2 for the Codfather in a week! Are his mystical powers fading?? ?